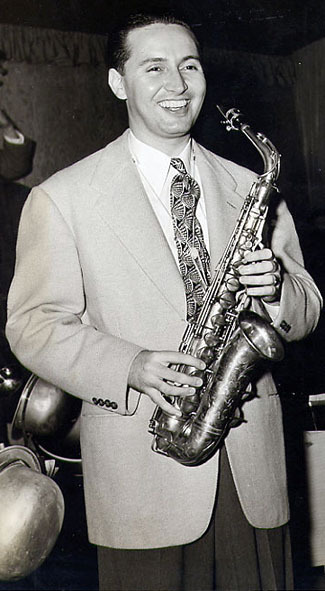 Big Band Library: Hal McIntyre "A Great Guy"
Commodore in New York City; the Trocadero in Denver, CO; and the Hotel Sherman in Chicago. During World War II, the McIntyre band often entertained U.S. servicemen, and on January 30, 1945, they performed at President Franklin D. Roosevelt's birthday ball, held at the Statler Hotel in Washington, DC. McIntyre and his orchestra recorded for Victor in 1941-45; a sampling of their noted discs from that period, including The Commando Serenade and South Bayou Shuffle (which he and Matthews co-arranged), Daisy Mae (an original by Billy May), and a cover version of Les Brown's Sentimental Journey, were reissued in 1957 on LP as "Hal McIntyre's Best" (RCA Camden CAL-302). The band switched to Cosmo in 1946 and MGM in 1946-47. During the 1950s, when the popularity of many bands, including McIntyre's, began to decline, he still recorded but on a free-lance basis. There was a 10" album for Columbia in May 1950 ("Dance Date with Hal McIntyre"); a Decca session with The Mills Brothers in June 1952, during which he and his band accompanied the vocal group on what became a big hit, Glow Worm; and a 10" LP of pops for MGM in November 1952. McIntyre's last recordings were made around 1958 ("It Seems Like Only Yesterday," Roulette R-25079). To supplement his dwindling income as a bandleader, McIntyre had purchased a chicken ranch in Coeur d'Alene, ID with Jeanne McManus, whom he had hired as his vocalist beginning in late 1952. In the fall of 1958, McIntyre's band performed along the west coast, like in Portland, OR and Yakima, WA, but then the work really dropped off. In fact, after playing at an air force base near Riverside, CA on March 9, 1959, the band became completely inactive. His booking agency, General Artists Corporation (GAC), put together a string of dance dates throughout the west and southwest in April, and was trying to secure a long engagement for the band in Las Vegas, starting in late May. However, early in the morning of May 3rd, while resting on a couch at McManus' Hollywood apartment, McIntyre apparently fell asleep while smoking. Flames engulfed the place and he was burned severely over his entire lower body. Firemen found him unconscious, under a smoldering blanket on the kitchen floor, and McIntyre, only 44 years old, died a couple days later at a local hospital. It was a shocking end for "one of the really nice guys of the big bands," as Simon referred to him. "Band Leader Near Death After Fire in Hollywood: Hal McIntyre Hurt at Home of Vocalist,"
Los Angeles Times, May 5, 1959, p.2. When His Cigarette Fired Couch," Los Angeles Times, May 6, 1959, p.19. "Final Bar: Hal McIntyre," DownBeat, June 11, 1959, p.13. Charles Garrod, Hal McIntyre and His Orchestra (Zephyrhills, FL: Joyce Music, 1974). "Hal M'Intyre [ sic ] Dies At 44: Orchestra Leader Had Been With Glenn Miller Band,"
New York Times, May 6, 1959, p.39. "Hal McIntyre," International Musician, June 1959. Don Pentleton, e-mail to author, June 14, 2009. At the age of 10, he began taking lessons on the saxophone and two years later started on the clarinet. He was considered "one of the most charming and genuine men in the whole dance band field," according to author-historian George T. Simon. McIntyre was the first person Glenn Miller hired for his new band in 1937. He stayed with Miller until 1941, becoming not just one of his musicians but also a close friend. In October '41, with Miller's financial support, he organized his own group. Sidemen with McIntyre's band included, at various times, Joe Weidman, Walt Stuart, and Ernie Bernhardt (trumpets), Howard Gibeling (trombone), Dave Matthews and Bob Poland (saxophones), Jack Lathrop (guitar), Eddie Safranski (bass), and Helen Ward, Gloria Van, Ruth Gaylor, or Frankie Lester (vocals). There was even a "John Popa" ( ! ) on tenor sax. A poll of colleges by Billboard magazine chose it as "the most promising new orchestra" in 1942 and again in 1943.